How much does a pair of football boots actually matter in a player's performance? Is there really much of a difference between the Adidas and Nike boots range for example? In this article, we go back to the beginning of Cristiano Ronaldo's career, reviewing his most important boots choices in the past 11 years. Cristiano Ronaldo has been a massive fan of Nike's Mercurial range since his early days in the Sporting Lisbon academy. Built for explosive speed, the Mercurial boots are the perfect choice for the Portuguese star, who has been defined as one of the best players in the world and has become a major figurehead for Nike. Ronaldo is said to be on contract with the American multinational corporation that earns him 14.1 million pounds per year, an astronomic figure that makes of him the best paid footballer across the globe in what sponsorship deals concerns. This Saturday afternoon, Ronaldo will present his all-new "Nike Mercurial CR7 Superfly" boots at the Real Madrid vs Barcelona live clash at the Santiago Bernabéu. Since 2010, Ronaldo has had numerous "CR7" signature editions, and today the brand new Mercurial CR7 Superfly football boot was revealed. If you’re a fan of Ronaldo and fancy taking a look at some of the key boots the Ballon d'Or winner has worn over the years, read on! The first time we saw Ronaldo play against Manchester United, he was wearing the Chrome Nike Mercurial Vapors. 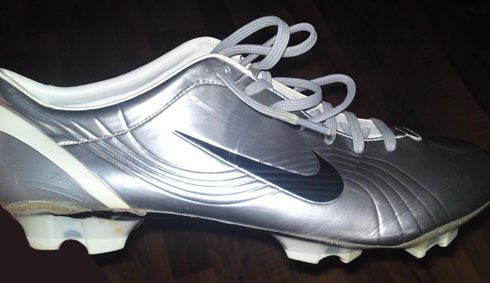 First released in 2002, the boots were originally praised by Ronaldo for being lightweight and suiting his style of play. Ronaldo led Sporting CP to a 3-1 win against United and caught the attention of Sir Alex Ferguson, who eventually signed him. When Cristiano Ronaldo joined Manchester United back in 2003, it didn't take him much time to change to the newer Nike Mercurial Vapor II. They were stated to be a little bit tougher and had a fewer design tweaks to the previous boot, but other than that, they had a very similar tech. He wore the gold version when he played for Portugal in the EURO 2004. Ronaldo donned the Nike Mercurial Vapor III throughout 2006 and 2007, and during this time he received consecutive Barclays Player of the Month awards, the PFA Players' Player of the Year, PFA Young Player of the Year and a variety of other honours. 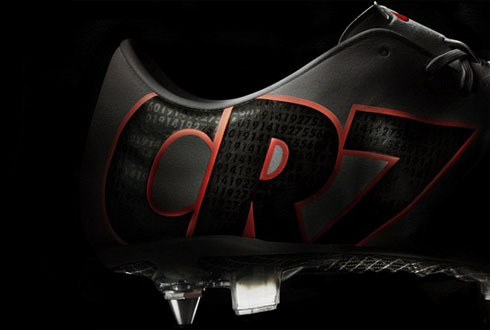 He also wore these boots during the 2006 FIFA World Cup tournament, where Portugal came in fourth place. 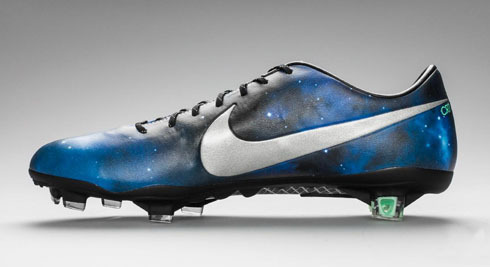 In 2010, Nike released a signature Mercurial colourway created for Ronaldo. With the technology exactly the same as the Vapor Superfly II which Ronaldo wore during the 2010 FIFA World Cup, the CR7 Safari Boot has a silver safari print upper to stand out on the pitch. 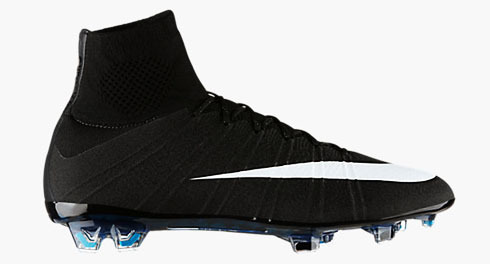 In September 2013, these new Galaxy boots were released. The Mercurial CR7 Galaxy is designed for explosive speed and has a never-before-seen bold galaxy graphic for a unique style. Built with two layers of glass fibre for a flexible forefoot and soleplate with twin stud configuration, these boots offer excellent speed and traction for a skyrocketing performance. On the 23rd October 2014, Nike revealed the brand new Nike Mercurial CR7 Superfly football boot, which has been tailor made for the Ballon d'Or winner and Real Madrid forward, Cristiano Ronaldo. Unlike the rest of Nike's boot range, the Mercurial CR7 is specifically designed for Ronaldo to enhance his skills on the football pitch, as he strives to remain the one of the world's best footballers. With a unique fit, excellent traction, expert touch and a unique CR7 gala colourway, these boots are designed to make an impact on the pitch. Cristiano Ronaldo next game for Real Madrid is a league Clasico against Barcelona, on October 25 (Saturday). You can watch Juventus live stream, Real Madrid v Barça, Sevilla vs Villarreal, Man United vs Chelsea, Sunderland vs Arsenal, and Werder Bremen vs Koln, all matches provided from our soccer live section.